So lately I think my post are getting a little to serious for my liking, so I'm going to get sidetracked and ramble on about meaningless, lighthearted things. 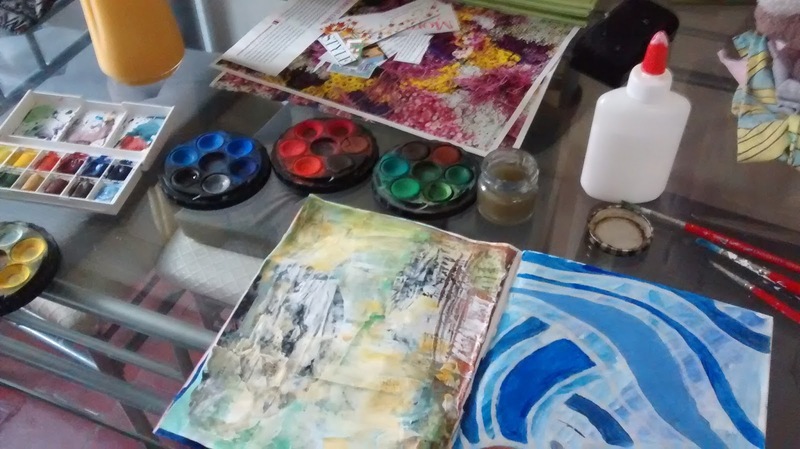 So I'm going to ramble on about art journals. For those who don' know what art journal it is a random book where you just make art. It doesn't have to be good or pretty nor does it have to make sense. You just make art, usually in a sketchbook. 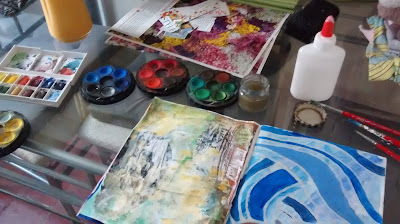 I once saw an awesome quote that said that an art journal was just having a visual conversation with yourself. That pretty sums up what art journaling is. You just create things, with no purpose other than to have fun. I personally find it very therapeutic. It's nice just to send time just doing something fun. I started about two and a half years ago. My first art journal was terrible. It was so bad but I loved it all the same. It was scrappy, disorganised and not very pretty to look at. The process of making it was so nice. Above was a photo I took whilst I was working on some of my current pages. I personally get a lot out of art journaling if you let go. by letting go I mean not thinking it has to be perfect. If you look up art journals on YouTube you will see loads of perfect, pretty amazing sketchbooks and they are really nice to look through and are not bad things. But you have to be careful that you don't try and make it perfect as you lose some of the magic of it. Art journaling is a form of release for me. It's a safe place where I can jut let go, have fun and experiments. It's a place where it is ok to get things wrong. In today wrong I personally find there is a load of pressure to get things right all the time. In my art journal it is ok to screw up! I cant tell you how much of a release it is to have that. When I come home from a bad day at college I just sit down and play for a while. I'm doing something that I enjoy but at the same time I can let my brain switch off and relax. I use mixed media in mine. I will literally use everything and anything that think will make my page look how I want it to. I use pictures from magazines, string that I find in draws, acrylic paint, water colours, crayons, coloring pencils and of course GlITTER. So this is quite a short post for me, I've got a longer one already wrote but I really did think that everything I was posting was getting a little too negative at points and I just wanted to take a break and share something that I find fun. But if anyone is ever wanting o see in detail any of my finished pages in my art journals let me know in the comments, it's a post that I'd like to do but I'm not sure about it just yet.